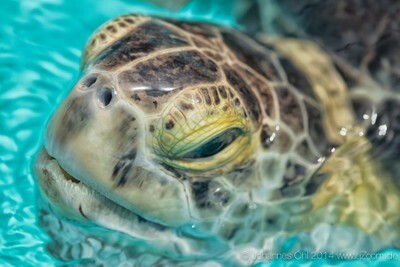 This photo was shot at a "The Turtle Hospital" (www.turtlehospital.org) in Marathon, Florida. It's a non-profit organisation to rehab injured sea turtles and return them into their natural habitat. This green sea turtle was swimming in a big pool.It is awesome to see them from the near. They are very elegant swimmers. My son and I where on a guided tour at 9am to learn something about the work of the hospital and the behavior of turtles. I wanted to show so many details of the head as possible. It's fascinating to see the "teeth" fo this green sea turtle. I increased a little bit the saturation and the sharpness. The photo is slightly croped. At this time on my travels I have my Nikon D800 and some lenses: AF-S NIKKOR 50 mm 1:1,8G, AF-S NIKKOR 80–400 mm 1:4,5–5,6G ED VR + 1.4 Teleconverter, two 20 years old lenses: Nikkor 28mm 2.8 AF, Nikon AF Micro NIKKOR 105 2.8 AF , Metz flashlight and a Gitzo tripod with Arca head. You have to foresee where the turtle is coming up next time, to get the photo. So you have to observe the animal quite a while to get the rythym of breathing and movement. The turtle is "living" on the photo because it fills the frame.